Today we decided to work with what ever we had in our kitchen. That just happened to be powdered sugar and brown sugar. 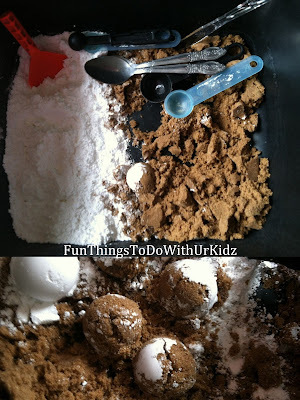 So I threw both in a bin, added some spoons and things for playing and handed it over to my little ones. My kids made quick work of using the spoons to make mountains by packing the sugar. I asked my kids how it felt and even joined in. My daughter describe it as Kentic sand feeling and once the two are mixed it is like Kentic sand.